Member of the Salicaceae (willow family) with other willows and poplar as relatives. Produces grayish-white fuzzy catkins up to 1 inch long, closely spaced along woody branches. Branches are woody, cut to various lengths. Willows have separate male and female plants and it is the male trees that produce the decorative catkins. 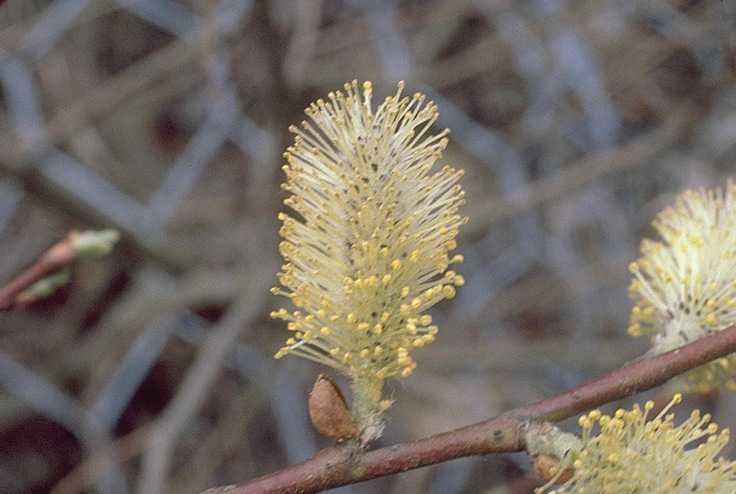 Salix discolor is used for its decorative catkins which are smaller than S. caprea. The specific epithet name “discolor” means of two colors and “caprea” is in reference to a goat. Aspirin (acetylsalicylic acid) is one of the most commonly used drugs in the world. For centuries, people have used the bark of willow trees to relieve pain and fever without knowing that aspirin as salicylic acid was the active ingredient. We now know that salicylic acid is likely ubiquitous in plants and is involved in many plant growth and development functions.